So, you've finally decided to visit Durango, with your bike in tow. Now what? You could try and find a trail, stop at every intersection, pull out the map and hope you pick the right way. Or you could leave it to the pros. Let Durango Mountain Bike Tours make it easy for you. With over 20 years of experience riding the trail systems surrounding Durango, we can customize a ride to fit your needs and ability level. We focus on providing high-quality service and customer satisfaction - and will do everything we can to meet your expectations. 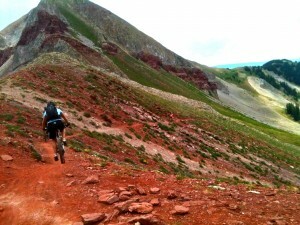 Durango Mountain Bike Tours is owned and operated by John Robinette. Offering rides for the beginner to the hard-core enthusiast. 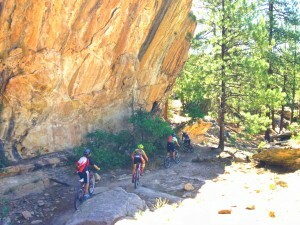 John guides riders along Durango's most fun and exciting single track trails. We can even start and finish our ride at your hotel or condo door. Every ride comes with a scenic view and explores amazing terrain. No bike, no problem. We can arrange a rental for you with the latest high performance bicycle. Call now to begin your "True Durango Experience." 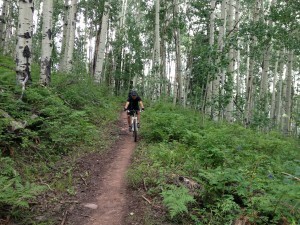 Durango Mountain Bike Tours specializes in guided mountain bike tours on the 85 plus miles of pristine single track surrounding the town of Durango. We operate April through November, offering customized 2, 3, or 4 hour rides for all ability levels.